The ASSITEJ SA and Pillow Fort Theatre tour took place in Kimberley from the 13th to 18th November. 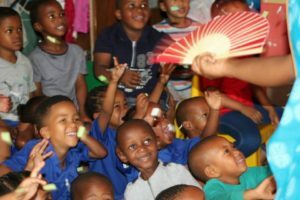 Five crèches were given the opportunity to see ‘JUST HERE’ performed by Pillow Fort Theatre, including Rainbow Kids Day Care, St Cyprian’s Grammar School, Ntsamaise Day Care, Rethabile Day care and AGM day Care. 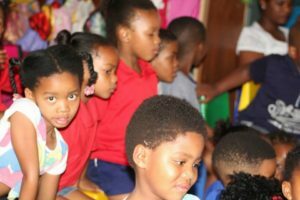 Over 360 kids in Kimberley were reached including 55 from Kwantu Renaissance Book Club. 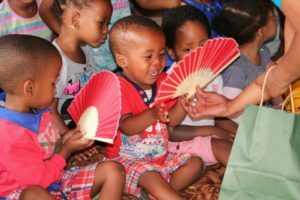 As part of the tour daily workshops for Artists interested in making works for young audiences took place place at the Mayibuye Multi-purpose Centre hosted by the Mayibuye Dance Academy. The workshop was attended by 9 artists who showed diverse skills. The workshop was packed with various explorations and tools for developing theatre for early years including music, object manipulation, paper puppets and physical theatre.The artists showed great interest in the different techniques and an outstanding amount of interest and passion for the work. On Saturday the 18th, the workshop participants presented the weeks outcome showcasing 4 different pieces developed through the process, with a multitude of skills. This intervention by ASSITEJ SA and PillowFort theatre has given hope to the Artists to see the future of theatre for young people. 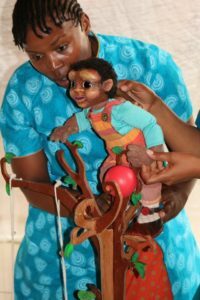 Participants have promised to go back to their spaces and test the skills imparted to them with the hope that they will continue to develop new work for young audiences by sharing the gained knowledge.